In a mixing bowl, mix flour, baking powder, ¼ tsp cinnamon and salt. In another bowl, stir in milk, brown sugar, butter, egg and vanilla. Combine liquid into dry ingredients until smooth. Let batter stand for 20 minutes. Combine rest of the cinnamon and sugar and pour onto a flat plate. Put strawberry jelly in a squeeze bottle. Heat frying pan with oil - MAKE SURE OIL IS HOT BEFORE PROCEEDING! Using a soup spoon or an ice cream scooper gently ease a small dollop of batter into the oil – it should form into a ball shape. Flip ball when bottom is golden brown and repeat. When both sides are golden, remove from oil onto a paper towel to drain. 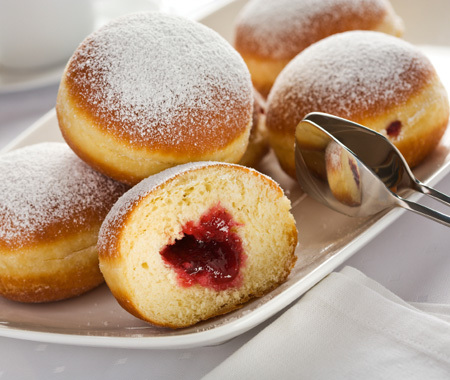 While ball is hot, dredge it in the cinn-sugar, and cool – When cool, you can inject the jelly into the ball or simply top it with the jelly/jam. Top with powdered sugar and serve. **To make these more like funnel cakes, pour batter into a ziplock bag, squeeze the air out of the back and then seal it. Then wind the bag, forcing the mixture to one end – cut the tip of that end off with a scissors. Gently squeeze the batter into the hot oil in a circular shape – Turn when first side is golden brown and remove when both sides are browned. Dredge in cinnamon sugar, add toppings and serve warm. Enjoy! Sift flour into a large mixing bowl. Add the salt and sugar and mix well. Add the yeast and mix. Using a mixer fitted with a hook attachment mix the flour mixture on low speed and add the egg and butter. Gradually add the warm milk and continue mixing for 8-10 minutes until the dough is soft. Make the dough into a ball and place it in a clean, lightly oiled bowl. Cover with a clean kitchen towel or plastic wrap and let rise until doubled in size, for about 1.5-2 hours. Once the dough has risen, place dough on a lightly floured work surface and using a rolling pin, roll the dough out to ¾ inch thick. Using a 2-inch cookie cutter, cut circles out of the dough, as close to one another as possible. Place the dough circles on a baking tray lined with parchment paper and cover with a clean kitchen towel. Allow to rise again for 20 minutes. In the meantime, heat the oil in a deep frying pan until it reaches 350F. Place around four dough circles into the oil and fry for 2-3 minutes on each side, until golden brown, but not too brown. Remove with a slotted spoon and place on a plate lined with paper towels. Repeat with remaining dough. Allow to cool slightly before filling. To fill: Fill a piping bag with your desired filling. Using a sharp knife, make a small slit on the top the doughnut. Place the piping bag inside the slit and fill until you can see the filling on top. Sprinkle with powdered sugar before serving.